Fostering is at the core of what Cats Protection is about, looking after cats in need until they are ready to go to a loving forever home. The outdoor pens we have for cats are extremely costly and we are therefore hoping to find some more volunteers to join our team to foster a cat, or cats, in their own home. Fostering is incredibly rewarding but can also be a challenge. 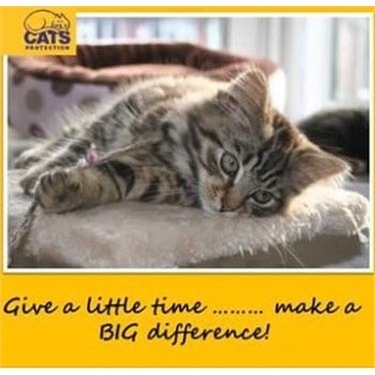 Cats come into our care for all manner of reasons, some from being mistreated or abandoned. Whatever the reason for their needing our help they all need a safe comfortable place to stay until they are ready to be re-homed. Some need more help than others to prepare them for their new home, but they all need a lot of love and patience. As an indoor fosterer you need to be able to give them lots of love and attention, and, when they are ready to go to a good home, to say goodbye to them. You will then be ready to take another cat and to face up to another challenge. This is really is rewarding work. One of the most important things is that you give your foster cats a huge amount of love, attention and patience. As an indoor fosterer you will need a well-ventilated spare room with natural light set aside for your foster cat(s) to live in so that they can be comfortable but kept separate from other pets you may have and also contained so they feel safe. If you do not own your own home, you will need to first obtain the written permission of your landlord to foster. There will be a requirement to take your foster cats to the vets for a health check, vaccinations, micro-chipping and neutering etc so having your own transport to do this is essential. The cost of equipment, cat food, litter etc will be covered by the branch as are any other costs you may incur and full training and on-going support will be available to you. Indoor Fosterers should be aware that members of the public will need to have access to viewing cats and kittens in the room. If you are interested, perhaps you could drop us an email (Click here). It would be good to know a little more about you before we arrange to come and meet you. Do you have a spare room where foster cats could be kept safely contained and separate from other pets? Do you own your own home or have written permission from your landlord to foster? Do you currently have any of your own pets? Do you have any children? If so what age(s)? Do you have your own transport for vet appointments and collection of cats? Have you any experience volunteering for a charity?